We work with a range of ski schools in Chamonix valley in order for our Resort Team to offer the most suitable option for your group. Beginners and experienced skiers will find something to suit them. Check out some of the most popular options below to book now or contact the Resort Team if you still have questions. Lessons time: Lessons can start on Sunday or Monday ​but price remains the same. Meeting Point: Club Piou Piou in Les Planards or Club Piou Piou at Le Savoy nursery slopes, in Chamonix centre. We will choose the most appropriate place for you depending on where you are staying, however let us know if you have a preferred choice. the lessons have to be in Les Planards area from 2nd star. Highly recommended for guests staying in Chamonix centre. Nursery can be available before and after the lessons, 8.30am-11.45am or 1pm-5pm and rate for lessons + nursery is 245€ for 6 consecutive half-days. Nursery and lunch can be available before and after the lessons, 8.30am-1.30pm or 12pm-5pm and rate for lessons + nursery + lunch is 335€ for 6 consecutive half-days. A fun and enjoyable way for children to learn to ski (snowboard on request), in small groups of 4 to 8 children. Evolution 2 ski school has a good level of spoken English; groups of children can be mixed (French, English etc). Ski courses for children from 3 to 12 years old. Equivalent to other star/medal ratings, the Yeti levels cover beginners in the private enclosed Panda Ski School learner area, through to skiing the most suitable slopes with instructors around Chamonix. Ski pass required: ChamonixLe Pass (CLP) which can be booked in advance through Chamonix All Year. No pass is required for Yetison. Meeting Point: Panda Club behind Lognan cable car in Les Grands Montets ski area. 15 minutes’drive from Chamonix centre. Highly recommended for guests staying in Argentière, Le Tour, Les Praz. We highly recommend that you book ahead of time for busy periods such as New Year or February Half Term. Lesson times: The lessons can start on either the Sunday or the Monday but the pricing stays the same. Ski pass required: ChamonixLe Pass (CLP) or Mont Blanc Unlimited (MBU) which can be booked in advance through Chamonix All Year OR Le Savoy / Les Planards ski pass to buy directly there. Nursery and lunch can be available before and after the lessons, 8.30am - 5pm and rate for lessons + nursery + lunch is 386€ for 6 consecutive full days. Lunch can be booked separately with an extra cost of 100€ for 5 days. Ski courses for children from ​6 to 12 years old, beginning to learn to ski or improving their technique in groups of 8 (beginners level) - 11 children max. Meeting Point: At the bottom of the Prarion cable car in Les Houches for the morning groups and at the top of the Prarion cable car for the afternoon groups. Highly recommended for guests staying in Les Houches. Your activity booking is provisional until you have received confirmation from us. Nursery and lunch can be available before and after the lessons, 8.30am-5pm and rate for lessons + nursery + lunch is 386€ for 6 consecutive full days. A fun and enjoyable way for children to learn to ski, in small groups of 4 to 8 children at all times of the season. Ski courses for children from 3 to 12 years old. Equivalent to other star/medal ratings the Yeti levels cover beginners in the private enclosed Panda Ski School learner area, through to skiing the most suitable slopes with instructors around Chamonix. Lunch: 1​1.30am to 2.00pm supervised time in the Panda Club which is kitted with toys and games for all ages. Ski pass required: Chamonix Le Pass which can be book in advance through Chamonix All Year. No pass is required for Yestison. From beginner to competition level, the instructors will do their best to help your children improve and have fun at the same time. ESF (French Ski School) has a good level of spoken English; groups of children can be mixed (French, English etc). Lessons time: Lessons can start on Sunday or Monday but price remains the same. Afternoon: Only during the French school holidays. A medal ceremony is held at the end of the week after the test on Friday. 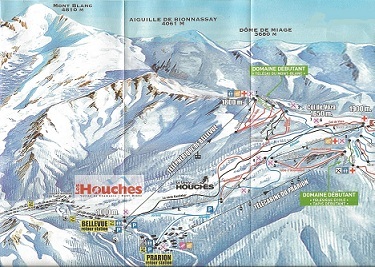 Ski pass required: MontBlanc Unlimited (MBU) or Les Houches ski pass only which can be bought through Chamonix All Year. Meeting Point: At the bottom of Le Prarion Lift, in Les Houches for morning lessons and at the top for afternoon lessons. ​Nursery and lunch can be available before and after the lessons. Ask our resort managers for more information relax@chamonixallyear.com. Need help getting there? Book a Chamonix All Year in-resort minibus - we'll take you there and back.